There is nowhere else in the home that needs to have so much technically going on that also needs to be a relaxing space. While it is important to engage the services of a qualified, and competetent bathroom fitter, there are a few pointers worth knowing. Understanding how the room is to be used is key. How watertight do the surfaces have to be? 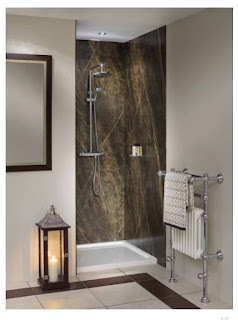 Many homes are including wetroom style areas. These are a great idea for smaller bathrooms and can replace the standard shower enclosure making a room feel larger. The preformed shower wall panels are ideal in place of normal tile and grout. These boards are tongue and grooved with finished edges and can easily be cut to fit. There are also a range of worksurfaces, and in some cases shower trays, to match. At this point it is also worth considering an extractor fan to promote ventilation of the room. There is nothing worse than a cold bathroom. While many rooms may have existing radiators it is worth considering other options. Underfloor heating is a great addition and works particularly well under tile flooring. There are also some fabulous designer radiators available in a variety of sizes and colours. Stainless steel radiators are more efficient as they conduct heat, rather than the chrome ones which feel hot but do not radiate the same amount of heat. Many of the designer radiators include towel rails or even shelving - ideal for where storage required too. Of course it is easy to replace a cumbersome, old, white radiator for a new one which may be more efficient. There are online calculators which will take your room sizes and advise how many BTU's you will require (British Thermal Unit). Check with the manufacturer of your radiator, as 1 kw = 3.41 BTU. Lighting is another area where some thought and imagination can create a comfortable environment. It is worth checking out the zones which require lighting and ensure that what is sourced is safe and practical. While downlighters are popular, it is worth considering where practical other sources. 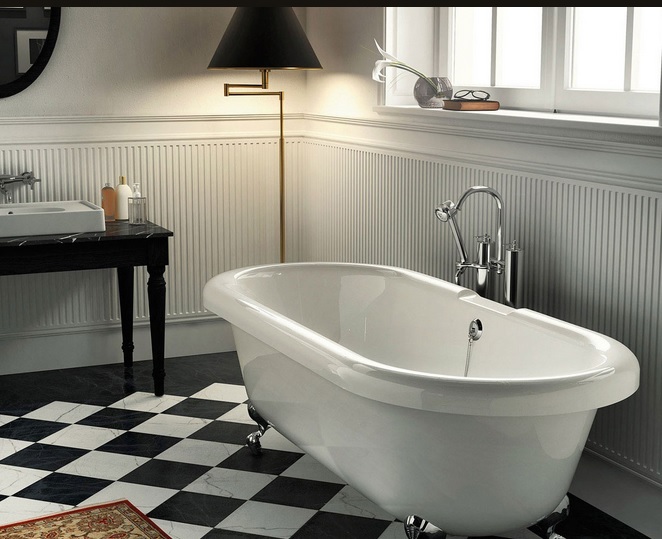 There are some great zone 2 chandeliers and uplighters which might suit a more traditional bathroom. LED backlit mirrors are also an excellent source of functional lighting. Practically it is worth understanding the impact of low water pressure before choosing showers and taps. Additionally some sinks will have no overflow hole and will require a different waste system. There are some really excellent ranges of vanity furniture available with very generous storage. And don't think the unit has to be white, light oak, or wenge only! Colours are definitely in, with oranges, purples, floral effects, and linen looks. Radiators too can come in a multitude of colours and finishes. And did you want swarovski crystals on your taps? Children's bathrooms can be fun! Funky colour basins and taps, co-ordinated with a coloured radiator can be fabulous. Styled with an unusual flooring, this room can really make a statement. There are no limits to how stylish a bathroom can become. In fact if you want any help then email me or come visit us at 80 Market Street Hoylake Wirral.